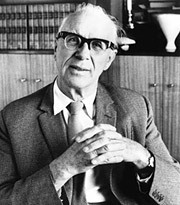 Ove Nyquist Arup was born in Newcastle in England but educated in Germany and Denmark. His father was a Danish consul and his mother Norwegian. The amalgamation of languages and cultural influences inherent in his family life was to develop into an ongoing theme in his life and play a significant part in his career. Arup's father, Jens Simon Johannes Arup, was the son of a printer and farmer. He trained as a vet, moving to Newcastle in 1889, where he consulted on the health of beef cattle. Arup's mother was his second wife. He had married watchmaker's daughter Johanne Munk in 1879 but she had died suddenly in 1890 in Denmark, leaving Jens to care for their three daughters Astrid, Ingeborg and Ellen. In 1893, Jens married the girls' former governess, Mathilde Bolette Nyquist, in Grimstad, Norway. She had studied English as an au pair in Ireland. Soon after Ove's birth in 1895, importing live cattle was banned in Britain and the family moved to Hamburg. Ove's brother Henning was born three years later. Arup's early education in Hamburg isn't as well recorded as his later schooling in Denmark. However, it is known that his preparatory school, which he attended with his brother, was run on "rather strict Lutheran lines". The school had an excellent academic reputation. However, its sympathy to German imperialism, which was rapidly gaining sway over the country at the time, turned the young Arups towards Danish patriotism. Arup senior planned to retire from Hamburg to Denmark. In advance of the move Arup, was sent to Sorø Academy — the second-oldest boarding school in Denmark and modelled on Rugby School in the UK — where he thrived both personally and academically. The school encouraged independent thinking and self-discipline. His boarding school days are well-documented and his love of learning is evident in letters, good school reports, magazine contributions, student messages, sketches and caricatures. He was an excellent student in spite of struggling with the language at times. It was here that he developed a passion for science and nature through his discovery of Darwin. This, in turn, awoke a spark of philosophical curiosity within him that was to be a defining feature of his personality. In the middle of his time at the academy, his father died of cancer (1911). His mother decided to return to Copenhagen. Arup was to live with her there when he later attended his first terms at university. Until the beginning of World War I, Arup's interest was divided among several subjects. In a school essay of 1909 he expressed a desire to study natural history, but by 1914 he was questioning everything, and probing deeply into religion and philosophy. During the war he wrote reams of personal thoughts, often troubled. It is also around this time that he first expressed an inclination towards engineering. "When all is said and done, it wouldn't be the worst thing to happen, to become an engineer. The joy of the work, the result, travel, books, music, people," he wrote in an unsent letter. Finally he chose to study mathematics and philosophy at Copenhagen University. However, by 1917 he became frustrated with the abstract nature of philosophy and craved to do something more practical. He eventually switched to engineering, spending six years at the Royal Technical College in Copenhagen. He did consider studying architecture but lacked confidence in his artistic abilities and decided he would rather be a first-rate engineer than a second-rate architect. Moreover, although he was now frustrated by philosophical abstractions and endless unanswerable questions, he never lost sight of an interest in truth, honesty and aesthetics. How he put these into practice in the world of engineering is the key to his story and the reason he stands out among so many engineers of his time. That he was on a lifetime quest to bring engineering and architecture together begins to emerge from the moment he graduates in 1922 and is taken on by the most eminent Danish civil engineers of the time, Christiani & Nielsen.